Greece’s Prime Minister Alexis Tsipras has made a defiant speech as cash withdrawal limits begin to bite for Greek bank customers. Mr Tsipras promised Greeks their pensions and wages would be safe. Before his speech he put new proposals to eurozone partners, accepting most of what was on the table before talks collapsed, but with conditions. But eurozone finance ministers later said there were “no grounds for further talks at this point”. Dutch Finance Minster Jeroen Dijsselbloem said the ministers had taken the decision “given the political situation, the rejection of the previous proposals, the referendum which will take place on Sunday, and the recommendation by the Greek government to vote ‘No’”. In Sunday’s vote, Greeks will be asked to accept or reject proposals made by creditors last week. Mr Tsipras’s latest offer to creditors is tied explicitly to agreement on a request for a third bailout from the eurozone’s bailout fund lasting two years and amounting to €29.1bn. In his address on Wednesday Mr Tsipras thanked Greeks for their “calm” in the face of bank closures and said their salaries and pensions would “not be lost”. 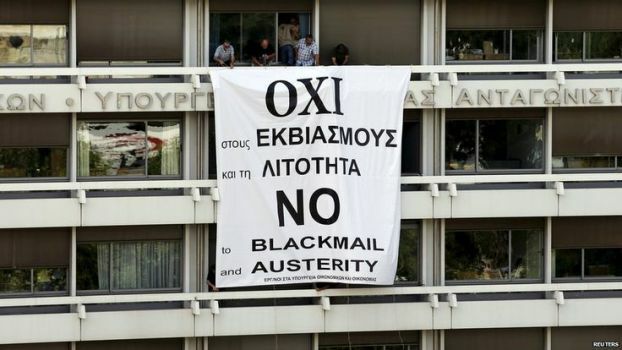 He angrily denied he had a secret plan to take Greece out of the euro, calling those who accused him of this “liars”.